Pumpkin spice may be all the rage on social media, but for millions of Americans, sweet potatoes will always take the cake, or pie, as it were. But I think it’s time to bring even more pie lovers to the spud side, and this decadent salted caramel sweet potato pie should do the trick. This post is sponsored by nutpods, an AMAZING, full-bodied, dairy-free creamer. And that opinion really is my own! But the caramel sweet potato pie recipe was created for us by the talented vegan cookbook author and photographer, Hannah Kaminsky. 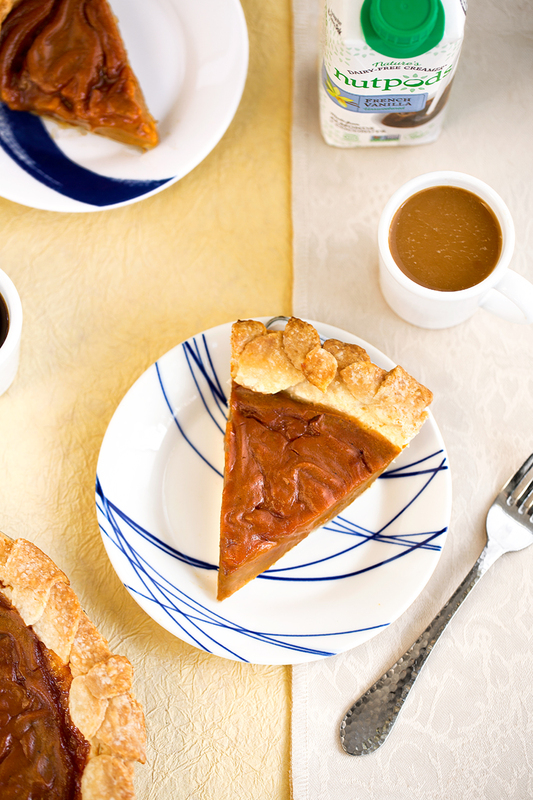 A little trick to making pumpkin pie non-dairy, or caramel sweet potato pie in this case, is to swap dairy-free creamer for the evaporated milk. It has an equivalent richness that produces a delicious, melt-in-your-mouth experience. 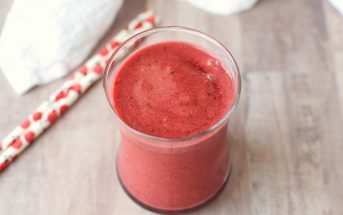 But you do want to stick with an unsweetened variety, which is just one of the reasons Hannah uses nutpods in this recipe. Hannah also realized that nutpods is the perfect consistency for making a restaurant-quality caramel sauce. And thus, this relatively easy, yet over-the-top decadent caramel sweet potato pie emerged from her oven. 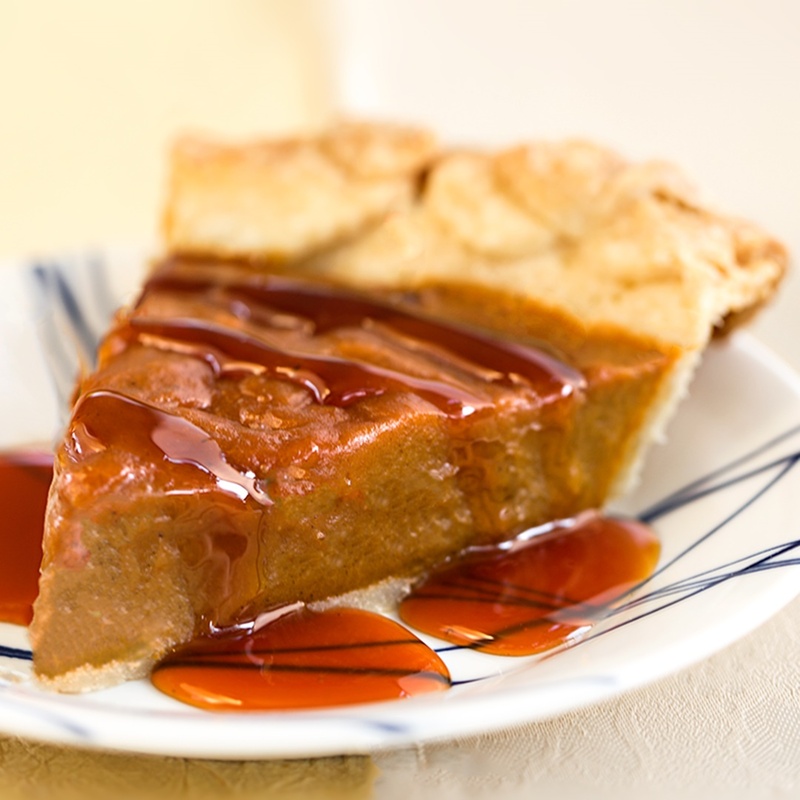 For egg-free needs, just a small amount of starch pairs with the dairy-free creamer to help this caramel sweet potato pie set up to the perfect slice-able consistency. If you don’t have tapioca starch available, don’t worry. Fortunately, non-GMO cornstarch or arrowroot starch can be used with similar results. By ingredients this recipe is dairy-free / non-dairy, egg-free, peanut-free, soy-free, vegan, and vegetarian. For a gluten-free, vegan caramel sweet potato use your favorite dairy-free, gluten-free pie crust recipe or store-bought version. 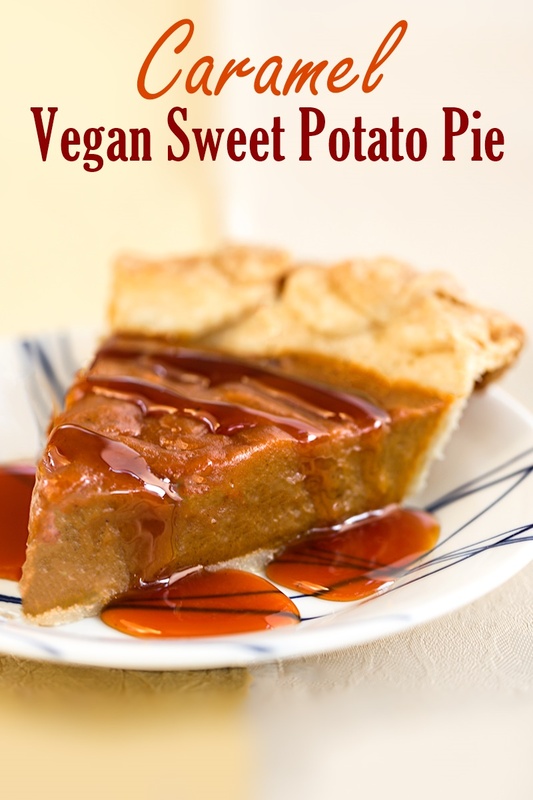 A luscious ribbon of rich salted homemade caramel sauce sets this vegan sweet potato pie apart from the pack. And after just one bite, even pumpkin fanatics must admit that the humble spud brings far greater style and substance to the table than that silly old squash. Combine the sugar, water, lemon juice, and salt in a medium-sized saucepan over medium heat. Once the sugar is fully moistened, do not stir the mixture. Instead, gently swirl the pan to mix. This will prevent the sauce from crystallizing. Cook the sugar, swirling the pan occasionally, until it turns deep amber in color. You want to cook it to a dark shade to give it the most flavor, but it should not smoke or smell burnt. Once it begins to color, it will progress very quickly. Once deeply colored, VERY CAREFULLY pour in the creamer. The mixture is likely to sputter and bubble up. Continue to cook the mixture for just a minute or two longer until the creamer is fully incorporated. Add the mashed sweet potatoes, creamer, sugar, tapioca starch, vanilla, spices, and salt to your blender or food processor. Puree until perfectly smooth, stopping to scrape down the sides as needed. Transfer the filling to your par-baked crust, and smooth down the top. Drizzle about ½ cup of the cooled caramel sauce all over, and use a knife or thin spatula to marble it throughout. 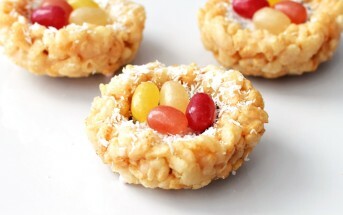 Bake for 50 to 60 minutes, or until the filling appears to be set and no longer shiny on top. It may still jiggle slightly when tapped, but it will continue to firm up as it cools. Let cool completely then refrigerate for at least 4 to 6 hours, for the cleanest slices. Serve with the leftover caramel sauce drizzled on top, if desired. I’ve never had sweet potato pie before! 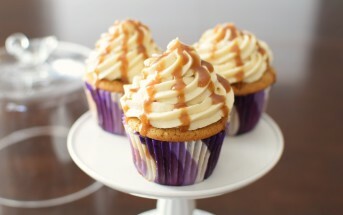 That caramel drizzle looks amazingly decadent! I feel like sweet potato pie is such an american thing! I have never tried it and seeing the pics I am 100% convinced I need to. The texture looks so nice and smooth. I’d even go so far as to say it’s a Southern thing Kortney! I grew up in the Northwest with nary a sweet potato pie in site. But I was happy to discover its popularity in other places! I love anything that has sweet potatoes in it… and my boyfriend loves anything with caramel on it. This will be great! And using creamer for caramel is a great idea! This looks extremely drool-worthy! I still need to make a sweet potato pie, (or Parfait) in my case! Love the caramel topping! I’m all about the parfaits, too Emily! Perfect for smaller households and fun for entertaining. Swapping out the evaporated milk for dairy-free creamer is genius! This is a recipe I’ll have to try. Thank you! I’ve never come across Nutpods before but I do swap out non-dairy creamer for evap milk sometimes. I also found an amazing coconut evaporated milk that I absolutely love! I’ll have to see how it works with the caramel ingredients! It looks amazing. The pie crust is simply stunning! What a perfect Thanksgiving dessert! Hopefully they will make their way to Canada soon Ricki! This looks so incredibly delicious. And it’s perfect for my kosher friend who always needs non-dairy (also known as pareve) desserts after a meat (turkey) dinner on Thanksgiving. Can’t wait to tell her about this creative, non-traditional way to enjoy a traditional Thanksgiving dessert. Mmmm, it looks so good! And that caramel sauce takes it right over the top! Am gonna make this soon! Yum! What other coconut and almond free creamer could I use tho? Would a cashew milk or cashew cream work? Or pea milk? Hi Michelle, if you can’t do almonds or coconut, then yes, a light cashew cream should work. I wouldn’t use just milk beverage. The sweet potato pie❤ A staple in my granny’s kitchen when I was growing up. This recipe looks amazing. I plan to make it for a vegan Thanksliving potluck that I’m going to next Friday. Thanks for sharing. That’s wonderful Katie. Thank you for sharing and I hope you enjoy! This looks heavenly! Love the addition of the caramel sauce! A nice change from the usual pumpkin pie! It looks like she achieved the perfect consistency with that filling and that caramel sauce looks divine! I know! Pretty amazing considering there are no eggs at all. Oooo I may have to bust this out for Thanksgiving! I think it would be perfect to bring with my mini pumpkin pies. You rock! Thanks for the inspiration. ooh yes, those would be complimentary, but different! I just love this time of year. All of these amazing, creative recipes! So much fun to try. You and me both Kerri! Can you believe I’ve never had sweet potato pie?! I’ve eaten my fair share of pumpkin pies…but I need to try this! Looks delicious! I’m all about delicious desserts during the holidays and I’d love to add this one to the table. I love the use of coffee creamer to make the caramel sauce and can’t wait to give that a try. Thanks Sarah! I know, right, it’s genius. I hope you get the chance to trial it soon! What a great way to include a dairy free dessert for the holidays! I’ve never seen these creamers, but I know a few clients who will be loving this recipe! Looks divine! Yes, caramel makes everything fun, delicious and festive! I highly recommend them – they’re different from the others.